This lesson will hide you through using the Sorting tab to change the default column(s) by which your rows are sorted. Open a Custom Report and click Sorting. If you place a "1" next to a column data set underneath Sort Order, then your report will automatically (by default) sort by data in that column first. You can also add 2, 3, and so on to next sort by additional columns. Click the Reverse Sort? column if you want data to sort in reverse, such as from 100 to 1 (rather than 1 to 100) or from Z to A (rather than A to Z). When you are finished making changes, click Submit. Click View to see your updated report. 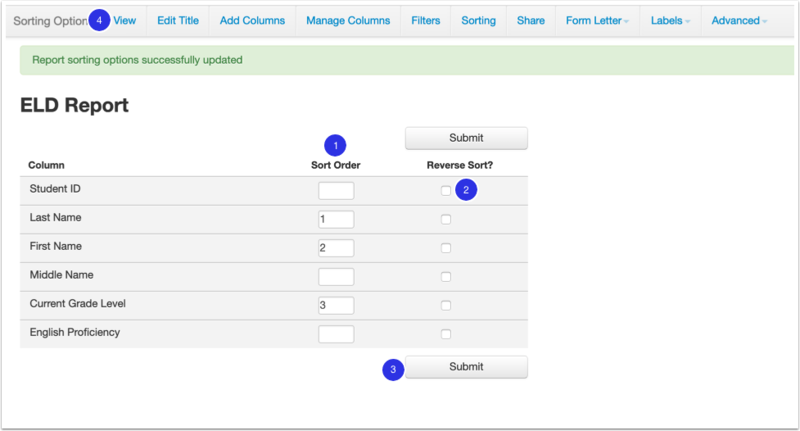 Data can also be sorted by clicking the column header when Viewing a report, but will return to the order on the Sorting page when navigating away and returning to the report. Now that you know how to Sort a custom report, learn more about how to Manage Custom Reports.